No trapping last night because of other commitments, but here's a poignant picture of a dead fly; Heliophilus pendulus or the 'sun-loving dangler' if I am not mistaken. It looks like one of those images of a traveller lost in a desert and finally giving up the ghost. Poor creature. I think it was the heat in our greenhouse which did for it. It's one of the UK's seven types of hoverfly, one of those fascinating and harmless insects whose aerial antics are very enjoyable on a warm and sunny day like yesterday. Too much sun-loving can be fatal, however, to flies as much as to us. Heliophilus is sometimes nicknamed the 'footballer fly' because of its bold black and yellow strip, the colour combination famously associated with Wolverhampton Wanderers. They had better luck at the weekend, beating Sheffield United 2-0. The trap was busy enough last night but short on novelties or anything particularly interesting, apart from this gallant old Red Underwing which seems to summon up the tattered but lively character of the best sort of old age pensioner. He or she is being watched in the top photo by the beady eyes of a Beaded Chestnut, a common visitor for the past few weeks. By way of compensation, moth enthusiasm among our neighbours continues strongly. Next door even had a moth burglar the other night, which fluttered round an alarm sensor in the small hours and set the bells ringing. Down the road, where we went for a lovely birthday party yesterday, the top room of a thatched cottage is full of hibernating Small Tortoiseshell butterflies. The young couple who live there fall asleep counting them, instead of sheep. And one of our own. Don't they make you feel drowsy already? I am spending part of my weekend sorting out the IDs of the moth jumble below. Any help appreciated, as always. Otherwise have a pleasant rest from the labours of the week which for us retired folk are just a distant memory, ha ha. Isn't this handsome? I know what it is but can't just remember at the mo. Update: and Richard beats me to it, kindly and helpful as ever. It's another newcomer, a Pale Mottled Willow. Very many thanks. And a final tiddler, which shouldn't take too long to sort out once the Bible is examined. Mille milliards de mille sabords de tonnerre de Brest, comme dit le Capitain Haddock en Tintin, je vois des statistiques de Google Blogger que a ce moment le plupart des liseurs de Martin's Moths sont en la belle France, pays d'amour, de degustation incomparable et de amitie pur les papillons de nuit. Nous avons aussi une presence formidable en Canadie, ou beaucoup de gens parlent Francais. C'est tres agreable. Alors, bienvenue mes copains! En votre honneur, j'ecris aujourd'hui de nos vignes - inheritees de nos predecesseurs (pardon mon Francais, s'il vous plait, et l'absence de accents) dans cette maison. Nous fabriquons a ce moment jus de raisin de ces vignes - mais pas seulement de raisin. Regardez les photographs... J'ai peur que le jus sera aussi de millepattes, de petit escargot et de coccinelle. J'espere que j'ai tort; et je sais absolument que le seul papillon de nuit et l'un qui pose ici et en haut pour vous sur le bouteille de jus (premier cru). Je conclus avec une chenille - je ne sais pas le ID - qui Penny (Sou/Centime?) et moi avons vue en partir de Grey's Court, une grand maison tres belle maintenee par le National Trust. Il faut la visiter quand vous etes en Angleterre. Billions of blistering barnacles, as Captain Haddock says in Tintin. 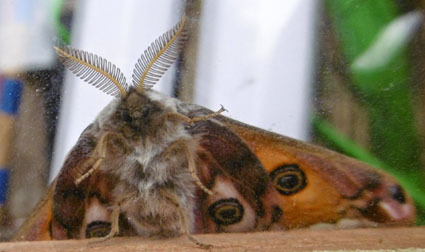 I see from the Google Blogger statistics that the most readers of Martin's Moths at the moment are in France, land of love, incomparable food and friendship to moths. We also have a formidable presence in Canada where many people speak French. This is very nice. So, welcome my pals! In your honour, I am writing today about our vines, inherited from our predecessors (please forgive the quality of my French and the lack of accents) in this house. At the moment we are making grape juice from these vines - but not only from grapes. Look at the photographs... I fear that we are also making jus of millipede, small snail and ladybird. I hope that I am wrong; and I do know for a fact that the only moth involved was the one posing here and in the top picture on our first bottle of juice. I am concluding with a caterpillar - I don't know the ID - which Penny (Sou/Centime?) and I spotted leaving Grey's Court, a beautiful house cared for by the National Trust. You must visit it when you are in England. This conundrum also applies to an extremely welcome star among Autumn moths in the UK which arrived in the trap this morning: the Large Ranunculus. I've been on about wanting one of these in my exchanges in Comments. I have been rewarded with two. It is a beautiful moth, dappled grey and flecked with orange in a pattern which must surely appeal to fashion designers, who have been inspired by moth wings for evening gowns. But why 'Large Ranunculus' - which means 'Large Buttercup' - when its caterpillars' foodplants consist of daisy, red valerian, delphinium, dandelion, michaelmas daisies (out now and lovely they are too) and even currant and plum? But not, apparently, buttercups. Maybe it's the golden-orange flecks. Meanwhile, here's another excellent Autumn newcomer: Blair's Shoulder-knot, which is almost as dashing and rakish as the Angle Shades. It's one of no fewer than three moths named after an enthusiast called Dr Blair who had the good fortune to live on the Isle of Wight. This is where most moths new to the UK make landfall after crossing the Channel and he was the first to find settled colonies of the Shoulder-knot, Blair's Wainscot and Blair's Mocha. Needless to say, during the reign of that other, human, Blair, these moths were mentioned in the House of Commons by Marilyn Moon, the Labour 'MP for moths' who runs a moth and bat night in the palace of Westminster every year. And finally, I love the Sallows so much, and their delicate variations, that here's a trio from this morning. The last picture is, perhaps, a nice summary of My Trap in Autumn. And again - the paler form Update: this is a straightforward Sallow. My learned and generous friend in Comments, Ben Sale, is excited on his excellent moth blog at the moment after the arrival of a species new to his list - an unusual event given his skill and knowledge, even of the small, brown and boring varieties. It's the delicate little Vestal, whose white robe with a slanting crimson stripe gives it a look of ancient Rome. The Vestals were six chaste young women who kept the sacred fire going in the temple of Vesta, goddess of hearth and home. If it expired, so would Rome, according to superstition. Under their common name of the Vestal Virgins, they were a source of great interest to schoolboys such as myself who had a classical education. The later and more dissolute Roman emperors were interested in them as well. The moth is appropriately pretty and by coincidence I was visited by the one shown here, on Tuesday night. I know I'm always going on about my pink eggbox, on account of the way its colour lightens up my pictures on these darker mornings; but I have to note the mismatch of pure and innocent-looking Vestal and the box's bordello hues. Update: I should have mentioned that, as Ben notes in his comment below, this is an immigrant moth and the subject of some interesting studies. These have found that its background colouring varies according to the temperature during its pupation period. Moths from warmer conditions have a yellower colour; those from milder climes such as our own, are paler. Amazingly, Vestals reach the UK from the Mediterranean. Some breed here in the late summer and produce more pallid Autumn children. I suspect mine is one of those. A rather different eggbox match features in the last picture. The various Sallows are doing their bit to cheer up the early morning too, and this couple - an ordinary Sallow on the hen and a Barred Sallow getting ready to scamper - found a highly appropriate sleeping place. Spiders get a sympathetic hearing here, as useful predators of less pleasant creatures, but I have to admit that it is alarming to watch them in lethal action. We discovered this the other day while cutting back a shrub in which a large Garden Spider had spun its beautiful web. The spider was in the process of trussing up an unfortunate crane fly which had blundered into the trap and was rapidly vanishing in a cocoon of sticky silk. Nearby fluttering caught our eye, and the spider's: it was another crane fly - perhaps the first one's mate - and within seconds, it was a prisoner too. There is little point in interfering in this grisly process which takes place all the time, all over the UK. Beatrix Potterland, it is not. But the story has a happy ending. On another shrub, these two crane flies were busy making sure that their species will continue. By coincidence, there was a magnificent spider's web on the car's wing mirror this morning, so strong that it survived a round trip to Kidlington. No prey in it, however; such effort for so little reward. Nature continues to bring us fresh surprises. Our gardening turned up this delicate wasp's nest below; and we found an eft - or immature newt - on the patio. The name is a fascinating piece of etymology: the Anglo Saxons called newts 'efts' which over the centuries changed for unknown reasons into 'ewts'. Fed up with trying to say 'an newt', the pragmatic inhabitants of our island changed the word again to 'newt'. Try 'an ewt' and 'a newt' and I think you'll sympathise. Lots of moths yesterday; just one featured this morning, but what a cracker! This is the Green-brindled Crescent, an autumn moth making its debut for me in Oxfordshire although its relatives used to call around this time of the year back in Leeds. Like the Burnished Brass shown yesterday, this is one of the relatively small number of UK moths favoured with metallic wing scales whose positioning uses reflection and refraction to give off that enticing gleam. Actually, rather than enticing, it is more likely to be a deterrent form of camouflaging, playing tricks with predators' vision as well as with the light. I photographed this one in various types of light, from outdoors on a misty morning - the first two - to indoors - first under a lamp, then with a head-torch illuminating the moth (you might have enjoyed the specatcle of my antics) and finally on a windowsill. In the last three, note that the colouring of our ancient Early Times mini-chest-of-drawers with William Morris's Strawberry Thief design has long ago lost its original green. It's now a blueish colour, again because of the effects of light. Early Times, too, has faded; indeed its shops have sadly gone altogether.